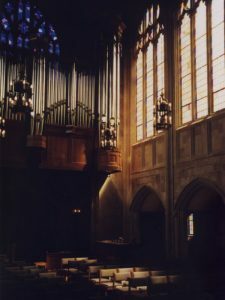 The Episcopal Chapel of St. John the Divine in Champaign, Illinois is a neo-Gothic limestone structure begun in 1927 and completed in 2007. 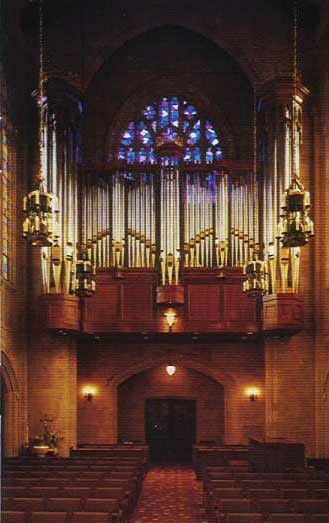 The parish voted to build a new pipe organ as the first phase of a long-term Chapel completion effort in 1989; the instrument was completed and first used in public worship on Advent I, 1991. 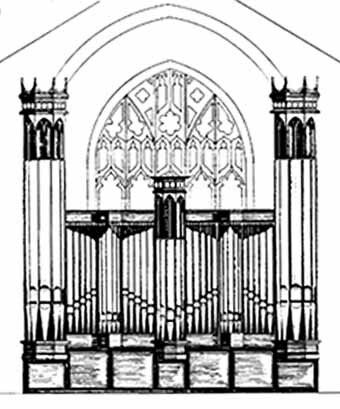 Designed to compliment St. John’s Gothic architecture, the mouldings and detailings in the organ’s three towers and flats match the details found in the limestone statuary niches and window tracery. The three crowns atop the towers are made from basswood and gilded in 23-karat gold leaf. 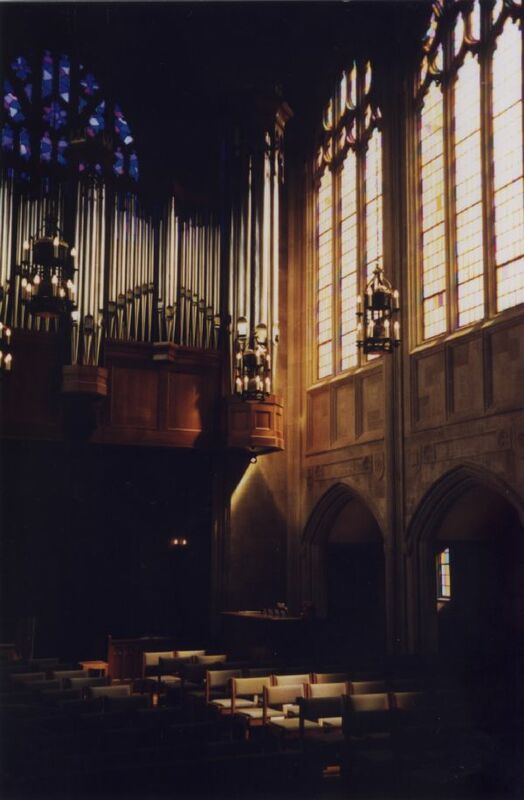 Carvings found on the pew frontals have been translated into the console’s white oak cabinet; additional carvings of tambourine, flutes and reed pipes decorate the console’s lower portion. 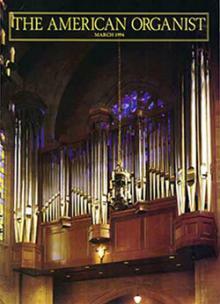 The Chapel’s solid Anglican choral program, the rich hymnody, and daily Cathedral-style liturgics demanded an organ of some substance; requiring a wide variety of tone colors at Unison pitch, complete development of the various choruses, and characteristics reed stops for the English Swell, a profound pedal, and high volume solo effects. 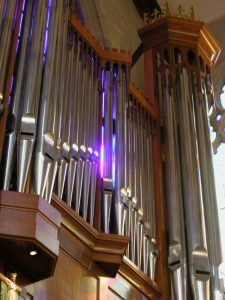 Although inspired by the great instrument at King’s College, Cambridge, this is not an “English Organ.” The instrument exhibits classic tonal design, but is voiced with a Romantic cast. 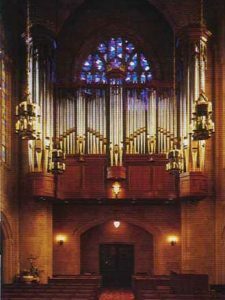 The budget for the organ (and the space available) would not allow for a large 16′ Open Wood Diapason nor an 8′ Swell Diapason. Scaling and treatment of the other Pedal stops and the Swell Salicional have to create the intended effect. 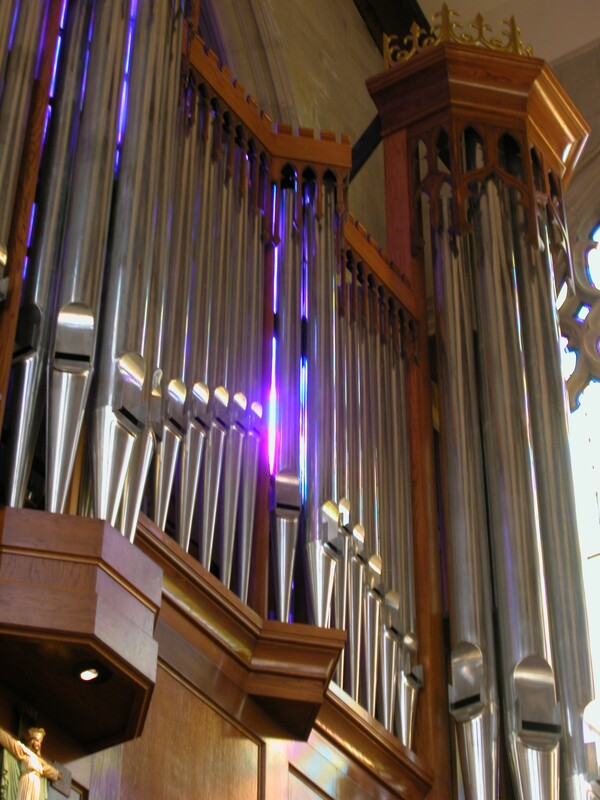 In order to increase the flexibility of what would otherwise be a straight two-manual organ, the Swell has been divided into two smaller expressive divisions, each on its own slider chest, and each with its own expression box and shutters. The Principals, Strings, and chorus reeds are in Swell “A”, and the Flutes, Cornet, Flute Celeste and Clarinet are in Swell “B”. This allows, for example, the Swell “A” Oboe to be accompanied by the Swell “B” Flute Celeste, or the Swell “B” Clarinet to be accompanied by the Swell “A” strings. The dramatic increase in accompanimental flexibility which the “Divided Swell” creates is facilitated by the modern solid-state multiple memory level combination action. 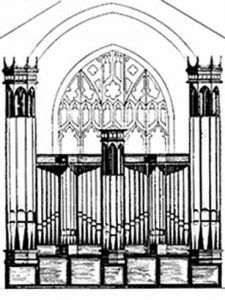 You can literally turn the organ upside down for one small section of an English Anthem accompaniment, then instantly bring the instrument back to a straight two manual by means of the general pistons. Pipes in the organ are made from a variety of woods and metals: 75% polished English tin was used for the facade pipes; metal flutes in the Swell are made of 15% tin with narrow mouths to provide a penetrating quality at the appropriate volume. The Great flutes are made of 50% tin with relatively wide mouths so they may be used in different ways with other voices. Reed pipes, with the exception of the wooden Pedal Trombone, are made entirely from 50% tin. The Tuba 8′, which plays on high wind pressure, is horizontally mounted atop the swell box, just behind the flats.